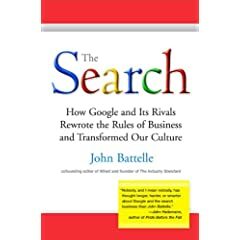 I recently finished reading The Search, How Google and Its Rivals Rewrote the rules of Business and Transformed Our Culture, a book by John Battle. I have to say that reading this book helped me recall the history of search, the history of many of the dotcoms in the past and it further helped me recall all the missing dotcom pieces I either forgot or just never knew. For example, do you remember that AltaVista was Google before there was a Google? This search engine had a clean interface and focused on returning the best results rapidly. The Search details how DEC botched making this search engine a success. Apparently corporate politics and just a lack of understanding of the search business is what did this early innovator in. To be fair, there were no maps to search engine success at the time and I am sure no one at DEC knew that one day AltaVista could become the next Google. This search engine did eventually sell to CMGI for 2.3 billion dollars of what soon became worthless stock. Overture finally purchased the search engine for $140 million and Overture was later sold to Yahoo. But there is more to this book than just history; Battelle has brilliantly described not only the past of search but the future as well. How will Google's ads integrate with TV? How will search look in the future? How will vertical search engines come into play and are these engines more accurate than Google itself? In summary, the book is fascinating as it takes you through a tour of the past, present and future of search. The writing flows smoothly and you never get bored. If you are interested in search, this book is definitely the Bible of the search market and worth a read. This search engine did eventually sell to CMGI for 2.3 billion dollars of what soon became worthless stock. Overture finally purchased the search engine for \$140 million and Overture was later sold to Yahoo.